TW: Misgendering and transphobia in history. "'Cause stayin' silent's the same as dyin'." HAIR: Black, short, and curly. HEIGHT AND BUILD: 5'8". Lean and scraggly. FULL APPEARANCE: Orru takes care to ensure that their figure is as ambiguous as their gender. They stand at 5'8", with a lean, slight build. They've developed strong shoulders and muscles from life as an unscrupulous trader and then as a rider, as well as numerous scars--the most prominent of which is a thin slash that traces the line of their cheek. When asked about it, Orru offers only a dark smile. They typically present as masculine, preferring either to pass as male or as androgynous, though they do have a fondness for soft colours and dresses. It's not something they've often had the chance to explore--but they sometimes like to wear subtle jewelry. A silk scarf, a silver ring, perhaps an earring--nothing that'll attract too much attention. His face is softly curved yet with sharply defined cheekbones--and he isn't opposed to powdering it with pigment to further emphasize the look he wants. Their eyes are slightly sunken, often with dark circles under them, and are a dark, blackish-brown in colour. His skin is relatively pale, but is able to tan enough that he can be in the sun without too much discomfort. Orru's hair is black, thick, and curly, and they always keep it cut very short. PERSONALITY: Perceptive & calculating: Orru's always had a sharp eye for detail--be it a shift of movement in a dark alleyway, or something glinting a purse. There's not much they don't miss--and they're careful about how they act, too. A thief's job is easiest to do when you're hard to notice. It's been a long time since he's last actually stolen anything, but old habits die hard. Even Orru's movements are soft and careful--rather like a wary, cautious alley feline. But also like a feline, his claws can and will come out if you push him. Practical & opportunistic: A life on the stormy seas isn't an easy one. They are very down-to-earth, preferring to think of what needs to be done here and now rather than what only could be. Flexible and adaptable, Orru isn't much of a stickler for 'how things are usually done', and they'll bend the rules if it seems like that would turn a larger advantage at the moment. Orru's always been focused on the short-term--something which will eventually come back to haunt them. Selfish & distant: Orru is quiet by nature, and not the most social person. His caravan knew him as a cool-headed and reserved type. They don't open up to many people, and few ever really get to know him well. There's much even his current wingmates don't know about him--besides that he's not a particularly warm or friendly sort. Indeed, Orru tends to put themself and their own interests first. That's what they think anyone would do; they aren't going to risk life and limb for anyone unless they can get something out of it. They've been hurt before, too, and they're afraid it's going to happen again. He's learned that you can't really trust anyone, and if you want to stay alive, you've got to stay on your guard. He tends towards paranoia. As a wingrider, they've been required to learn how to work in a team...and while they're getting better, it's been a learning experience. But there's a softer side to them... While their relationships with other people have always yielded mixed results, they've always been fond of animals. There's a gentleness in their eyes that shows only when they leave out a bowl of scraps for the ship-felines, or when they approach a nervous runner--quick to soothe and treat them with care he doesn't normally offer most people. If there's one being on the planet that Orru would do anything for, it's Laruth--no matter how crass rider and dragon may act towards each other. FAMILY: Note -- Orru has not been in contact with their birth family in a long time. Orru chose a new name for themself, so their name does not match their parents. Garalan - Father, fate unknown. Ila - Mother, fate unknown. Gilan - Older sister, fate unknown. Ilgar - Younger brother, fate unknown. Alton - Caravan leader, fate unknown. BIRTHPLACE: A cothold near Nerat Hold. HISTORY: Born into a little farming hold in near Nerat, Orru spent their early years growing up as the middle child of three siblings. Their parents were strict traditionalists, frightened of change and everything it stood for, and they were very quick to force their ideas onto their children. It was difficult for any of them--but for Orru especially. They felt trapped and stifled there, surrounded by a family that at best didn't understand them, and at worst tried to force them to be something they weren't. As he grew older, they began to struggle more and more with themself and their gender. His parents wanted him to act the way a 'proper girl ought to', and they felt they were being forced into a gender and a role that didn't suit them. They knew that eventually, they would be expected to marry and bring more working hands into the family, and the prospect of that made them deeply nervous. He felt miserable and lonely there, even with the support of one close friend he often confided in. But when a caravan of traders appeared, they saw a chance to escape. Their family was horrified by the seemingly haggard and unscrupulous group of strangers, who really were only passing through. Inspired by the chance at freedom they presented, Orru followed the leader and asked if they could join them. To their surprise, the caravan leader agreed with a toothy grin--and even suggested that they pretend to be a boy for the time being, just to be safe. He agreed without a second thought, and from that day on, they abandoned their old name--going only by the name Orru. It was tough work, but Orru found life aboard the caravan's ship far more interesting than anything they'd known before. He discovered quickly that the traders weren't entirely on the straight and narrow: though they did practice some legitimate business as a front, they did make at least some of their income from smuggling. It was somewhat dangerous, especially with the Interval War raging around them. But it was exciting, and wartime meant that a smuggler's job could be especially profitable. The whole of Pern had been opened to them: they traveled all across the seas with the caravan, visiting holds and trekking over land when needed, seeing things they couldn't have imagined--and proving their own strength to the traders they worked with. More than anything, they liked the sudden freedom that they now seemed to enjoy. They felt free to dress how they wanted, and act how they wanted without their parents to tell them otherwise. But they learned to be careful to follow their leader's discipline, too, and not to push things too far. It didn't matter if he was a girl or a boy as long as he could do what they asked of him. Initially, that was mostly scrubbing the ship's decks or tending to the draybeasts, but as he earned their trust, he became a fence...and a pickpocket himself, too. These were all petty crimes, small things, things that were relatively easy to cover up. And though it certainly wasn't the right thing to do...was a rich fancy holder really going to notice if one of her many jewels went missing? Of course, this shady life had little in the way of any real security. A sailor was always at the mercy of the sea. Orru was left behind to watch over their business at Southern Boll Hold, as they'd often done. As time went on, though, their caravan never returned. Orru waited. Waited, and waited, even as their marks ran out and they took up drudgery as the only means to support themself. They never learned if they'd been abandoned, or if the sea had taken the closest thing to a real family he'd ever had. A skinny and lonely 17-turn-old, Orru grew exceptionally cold and withdrawn. They had no one. No one at all--and they turned to stealing far more than they had before. But things would change again after they tried to pickpocket a Searchrider from Telgar. When the rider's dragon told them they saw potential in the scraggly young thief, the rider decided to show mercy: they said that they would not report Orru on the condition that they came to the weyr and became a candidate. Help do some chores around the weyr, and then he'd be free to go. Orru accepted. They worked off their so-called 'debt' within the first few months, but they willingly spent many more turns there, slowly adjusting to a new way of life. There was much more order than he was used to, but in a way, they were glad for that. For the first time in a long time, they were back on an honest path. Finally, at the age of 25, their patience was rewarded. In 2764, White Laruth was hatched, and chose them for their own. The white dragon was odd and rough, but that suited Orru just fine--and since then, they've quietly settled into their duties as threadfighters. They did their best to just keep out of the ongoing political tensions, doing their job as required, though they started to get itchy feet, too. They've heard of High Reaches' new, democratic ways, and after High Reaches suffered heavy Threadfall losses in 2767, they took up the opportunity to transfer over and help out. They're cautious, especially given the talk of recent assassinations...but hey, at least they won't be bored there, right? Last edited by peregyr on Sat Mar 02, 2019 8:06 pm, edited 5 times in total. Template by Jabberwoky and Wrenpuff; colouring by Jabberwoky. FULL APPEARANCE: Large and imposing--for a white dragon, anyway. Where his rider might be lean and wiry, Laruth is chunky. His wings are enormous. They seem disproportionately long for his body, and he's particularly ungainly and awkward on the ground. He has an odd, almost waddling gait--why, no one is certain; nothing in particular seems to be wrong with him. He has a long, pointed muzzle, almost resembling a beak, and his wings are narrowed at the ends. The underside of his body is primarily a standard white hue, with hints of gray on his neck and tail. The dorsal side of his wings are overall medium-gray, and faint, almost feather-like striping extends down his nape. His fore-paws and the tips of his wings are dipped in dark gray. 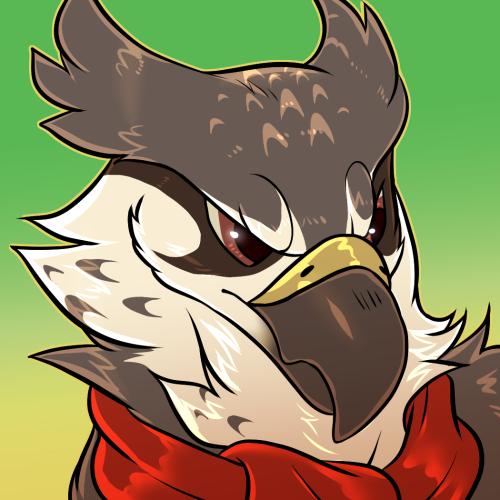 A pale gray mask covers his muzzle, further enhancing his beaky look. PERSONALITY: Laruth is best described as rough around the edges. With a mouth as foul as a sailor's and a complete lack of any grace or manners, he sticks out like a sore thumb around any more elegant brethren. He's crass, he's sarcastic, and he's not sorry about it. The dragon looks at everything with a hungry, wherry-like stare, and he's just as perceptive as his rider. He's an opportunist, and though his memory is just as bad as any dragon's, he knows that it's important to work with his rider as a team. Two heads are better than one, he thinks, and Laruth's been the one driving Orru to really learn how to work together. What does Laruth want, though? Ultimately, he wants safety and comfort for himself and his rider above all. He's a coward, and he'll balk in the face of open conflict--he doesn't actually want to fight anyone. Actually, he doesn't really want to do anything at all. He's a scavenger, not a hunter, and he hasn't got an ambitious bone in him. It's up to Orru to spur the dragon to actually get his job done. But when he's in the air, he's an efficient and elegant flier. His long wings allow him to easily ride thermals, though they make it harder for him to avoid strands of Thread. It's one of the few times Laruth really shines. Laruth identifies as male, and uses he/him pronouns. FULL APPEARANCE: A small brown, although he hardly seems to realize it. His body is overall a pale, creamy color, like the canvas found on a ship's sails. His torso, underbelly, and wing-bones are a brighter and darker brown. Darker stripes extend down his neck and tail. He seems well-proportioned overall. A handsome little guy for sure! PERSONALITY: Sailfish is best described as fearless and energetic. He's not at all afraid to leap into new situations. (Or people, as Orru discovered.) It's usually in a friendly way, but he can be quite pushy when snacks are involved. The brown doesn't actively seek to cause trouble...but he doesn't seem to care if it happens on the way. His favourite place to perch is on either Laruth's or Orru's head.